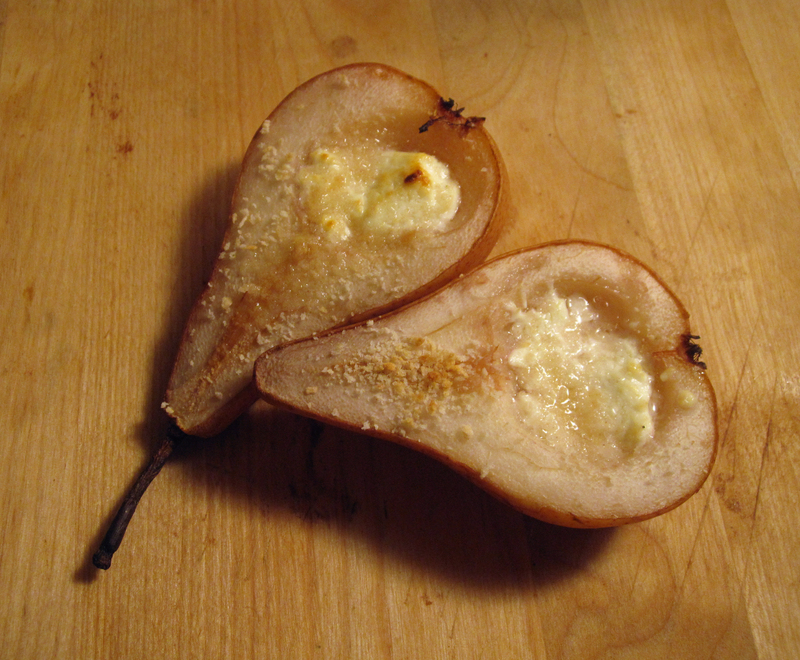 These pears were inspired by Terry. She made these for me & Sam, and I have to say that it was a real game-changer. Before this, I didn’t like goat cheese. I know, I know, but I just didn’t. But this warm baked goat cheese converted me. Now, I’m eating it warm, I’m eating it cold, putting it on salads, in eggs, on everything. So thank you to Terry (and her fabulous friend who inspired her). I didn’t write down the recipe, so this is just a riff- and perhaps there are embellishments that I am forgetting. But I made it last night, and it was lovely. It also looks great served on a bed of arugula. Preheat oven to 400. Put a little bit of water- just to cover the bottom of pan- then add a splash of red wine. Take pears, split in half, spoon out core. Slosh around the wine. Add a teaspoon or so of goat cheese in the middle. Bake for about 15-20 mins. Add some ground almonds- or I used a sprinkle of panko. Pop under the broiler for a minute or 2- to slightly brown the cheese and breadcrumbs. Watch closely. And that’s it. If I thought about it, I would have sprinkled some salt- and maybe pepper and a bit of lemon juice? I guess I could have added a little olive oil (or butter) too- but really, it was great as is. Would have dressed arugula with those though, fo’sho.